In March 2018, the Japanese Ministry of Education, Culture, Sports, Science and Technology revised the curriculum guidelines for high school, which will be applied in 2022. The subject of Informatics has been drastically changed; `Informatics I’ and `Informatics II’ have a predominantly scientific approach. 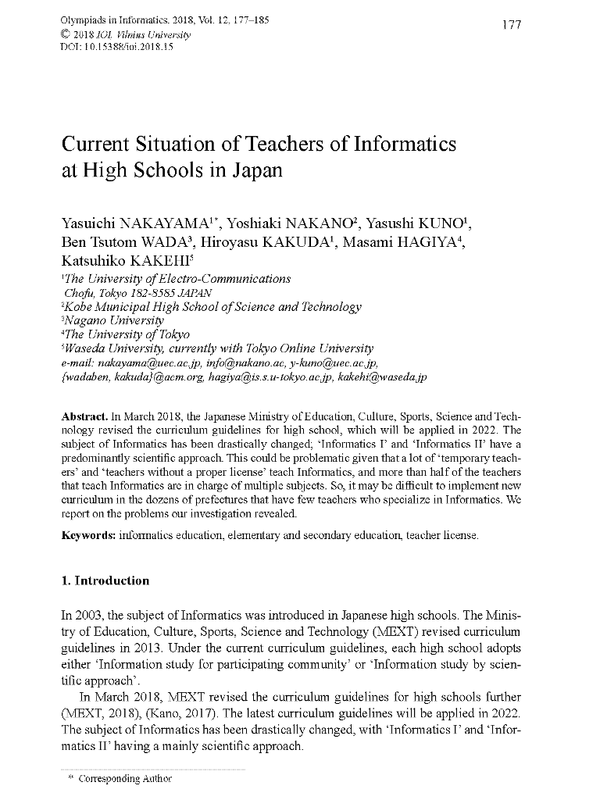 This could be problematic given that a lot of `temporary teachers’ and `teachers without a proper license’ teach Informatics, and more than half of the teachers that teach Informatics are in charge of multiple subjects. 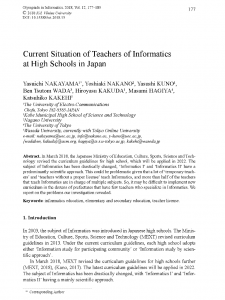 So, it may be difficult to implement new curriculum in the dozens of prefectures that have few teachers who specialize in Informatics. We report on the problems our investigation revealed. Olympiads in Informatics，Vol. 12, pp.177-185 (2018).